Rome Is Not A Town - Blood And Secrets. Background - 4 piece Gothenburg, Sweden unit Rome Is Not A Town released their debut 7” “Stupid” in late 2015. With their noisy postpunk they soon found a special place in the hearts of everyone with a fondness for cracking guitars and some furious drum beating. Swedish media got excited and the biggest ones such as Festivalrykten, Hymn and Gaffa soon compared them Sonic Youth. As a match made in heaven Rome Is Not A Town got the chance to tour a few dates with the Thurston Moore band soon there after. 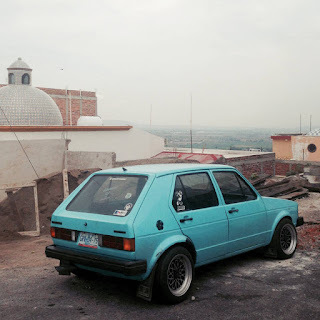 Sloucher - Waiting to Start. 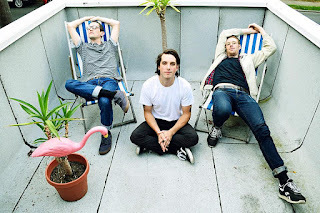 Background - Like a lot of bands, Sloucher started off as a relatively unambitious project. After writing a batch of songs on acoustic guitar to sate his downtime as drummer in a couple of revered West Coast bands Cayucas and Hibou. Jay Clancy decided to better harness the melodic thrusts bouncing around his head, eventually recruiting guitarist Kyle Musselwhite (The Globes) and drummer Jack Hamrick to solidify Sloucher as a trio. 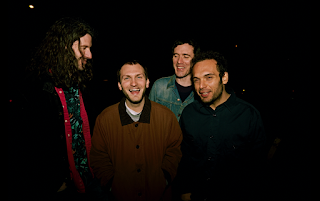 Background - Cairobi are a headily eclectic globe-crossing fourpiece of Giorgio Poti (vocals, guitars), Alessandro Marrosu (bass), Salvador Garza (keys) and Aurelien Bernard (drums). Their sound reflects their various backgrounds with a unique multi-cultural twist. Their debut self-produced album was written in Berlin and, fittingly with their diverse nationalities, was recorded between Berlin, London, Rome and New York. Music and this resulting album was Giorgio’s means of finding his way through health problems, as after relocating to Berlin, he started to suffer frequent, violent migraines that would incapacitate him for an average of twelve days a month. Super Paradise - The F.C. Background - Born in Milan, and now based in London, Super Paradise have just burst onto the garage scene in the UK with their debut album Quencebo: twenty minutes of high-octane rotary psych, both frenetic and melodious fusing the genres of garage, synth pop and psychedelia. Originally written and recorded by lead singer and guitarist Francesco Roma in his hometown, Milan, the record sees the collaboration of Nico Spreafico on backing vocals and now as guitarist in the live line-up. Since moving to the UK, they inspired keyboardist Juliet Styles and drummer Bradley Smith to join to create the full line up. Building on the edgy energy of Thee Oh Sees, the rough sounds of Parquet Courts and the soundscapes of New Order, the result is a hypnotic amphetamine rush with dizzying catchy melodies. Bandcamp here, and Facebook here. 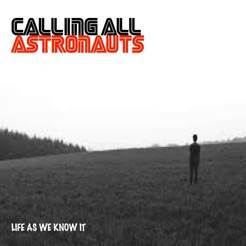 Calling All Astronauts - Life As We Know It. Background - 2016 has been another fantastic year for West London Electro Punks Calling All Astronauts. It has seen the release of their widely acclaimed second album “Anti-Social Network” Their single Empire hit #2 in the Official European Indie Chart, they’ve had two #1s in the Hype Machine Twitter Chart, they headlined the Bandstand Stage on the final night of Beautiful Days Festival. They have seen their Twitter following swell to over 500,000. They round off the year with their ninth single, “Life As We Know It” released via Supersonic Media on Dec 23rd in which we see a more mellow, electronic side to these usually noisy rockers. The single is backed by three remixes and would you believe a “shuffle” video. “We are not a band to release the same single over and over, yes they all sound like us, but we are very eclectic in our influences and I hope our music reflects this” David CAA. The Wedding Present - Broken Bow. 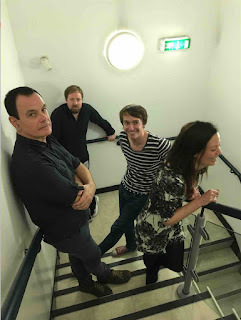 Background - The Wedding Present present their track 'Broken Bow' not long after premiering 'Kill Devil Hills'. These are among the more animated bustling tracks from their new album ‘Going, Going…’, referencing the interplay between alienation, distance and freedom for the first track and a sensual predatory encounter in the second. This UK indie cult band's widely anticipated ninth studio album gets its vinyl release on December 2nd in North America via Happy Happy Birthday To Me Records (HHBTM). The album retells the story of a road trip across the USA, revealed across a collection of twenty ‘linked’ songs, each with an accompanying short film.